Skill Level: Beginners should buddy with more advanced divers; otherwise it is an intermediate to advanced site depending on wave height. Location: At the south end of Carmel Beach in Carmel. Access: Drive west on Rio Road from Hwy. 1, turn left on Santa Lucia, and make a left on Scenic Road. Park on Scenic near the intersection of Martin Way. Entry and Exit: The beach is a short walk down a well-maintained staircase. Enter close to the rocks on the south side of the beach. Photography: Good macro photography for nudibranchs, and wide-angle photography for reef scenes. Hunting: This site is within the Carmel Bay State Marine Conservation Area where all invertebrates are protected; spearfishing is permitted, but discouraged. Cautions: Watch for breaking waves, and currents and boat traffic on the outer reef. You can expect to find thick kelp in summer and fall. How many times have you driven along California’s coast and pondered, “If I won the lottery which house would be mine?” While there are many houses worthy of a “lottery dream,” one stands out in my mind — the Copper Roof House in Carmel. In 1948 Della Walker approached famed architect Frank Lloyd Wright and asked him to design a house that would be, “as durable as the rocks and as transparent as the waves.” Mr. Wright took up the challenge and designed her house, which was completed in 1951. 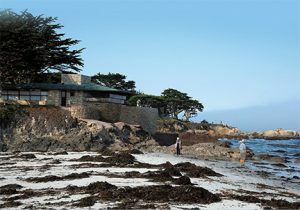 It blends in well into the gorgeous California coastline, and offers its residents a wonderful view of Carmel Bay. In addition to its location this house is memorable because of its oxidized green copper roof. Although expensive, copper is an ideal roofing material for this location since it resists the corrosive salt spray. Today, the Copper Roof House is a landmark for both divers and tourists. Divers enter the water off the sand beach to the north of the house. Sandy beaches are not common in Central California, and this is one of the nicest. It is a flat, wide beach that is perfect for a post-dive game of volleyball or Frisbee, or maybe just a little nap. Offshore you will find one of the thickest and healthiest kelp beds along the Central Coast. You do not have to swim very far to get into the kelp, since the bed begins just beyond the surf line. 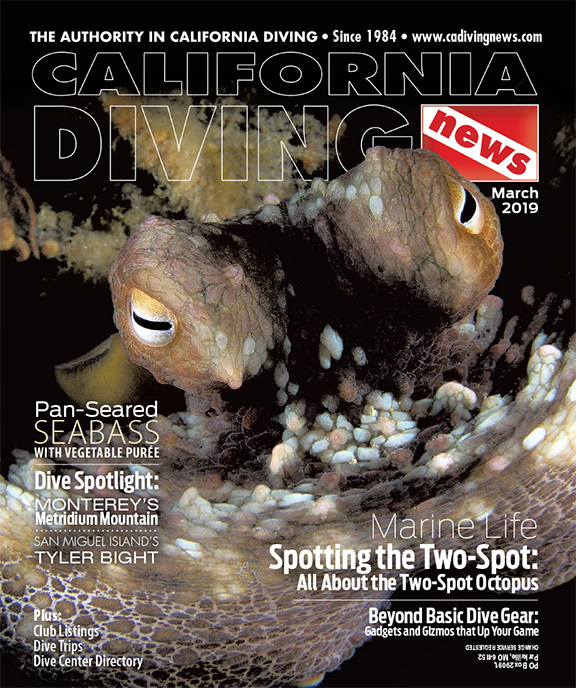 With all that kelp you can expect to find a healthy reef system with lots of California’s signature critters, and you will not be disappointed. 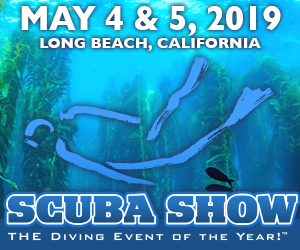 Beneath the kelp divers will find a patch reef system with large boulders interspersed among sandy patches. The rocks here are broken with deep cracks that offer protection to a cornucopia of marine vertebrates and invertebrates. Dock shrimp, crabs, and flat worms take refuge in the cracks, along with a surprising number of small abalone. The cracks here are so deep and narrow that otters can only look but not partake of these tasty critters. The same is true of divers since this site is part of a marine conservation area. 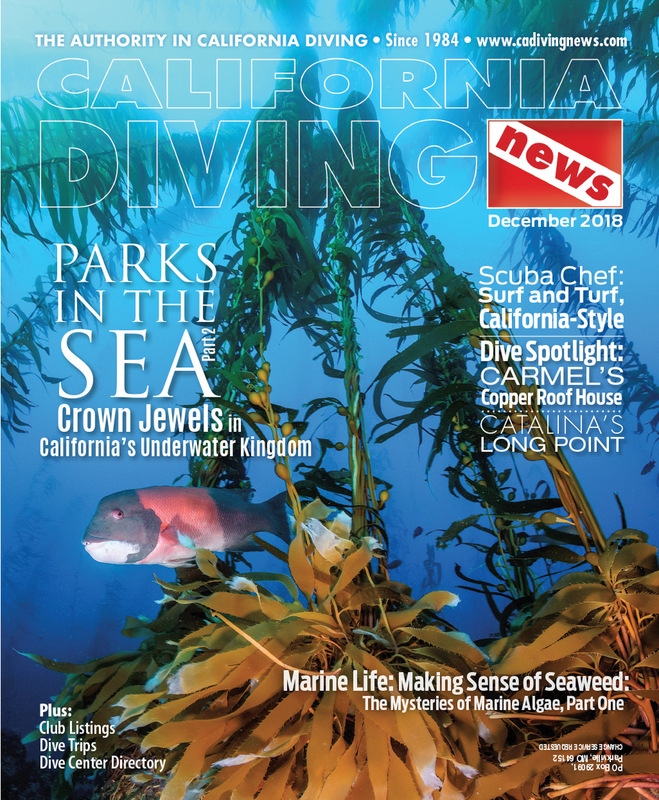 The rocks are covered with all of the invertebrates that make California diving so interesting. There are many species of tunicates, sponges and anemones. In particular the fish-eating anemones are impressive with their bright, red bases. They make their living by waving their tentacles into the current, and hope a juvenile rockfish wanders a bit too close. Nudibranch lovers will find an incredible variety of these shell-less mollusks here. In fact, this is one of the best areas for finding nudibranch that I know of. Some nudibranchs grow to enormous sizes here. These are of the dorid family and may be the size of your fist or bigger. There are also a number of smaller dorid nudibranchs here; these may be harder to find, but are more brilliantly colored. The orange and white clown nudibranch is one of my favorites, and the pink and white Hopkin’s rose is among the most stunning of the dorids. 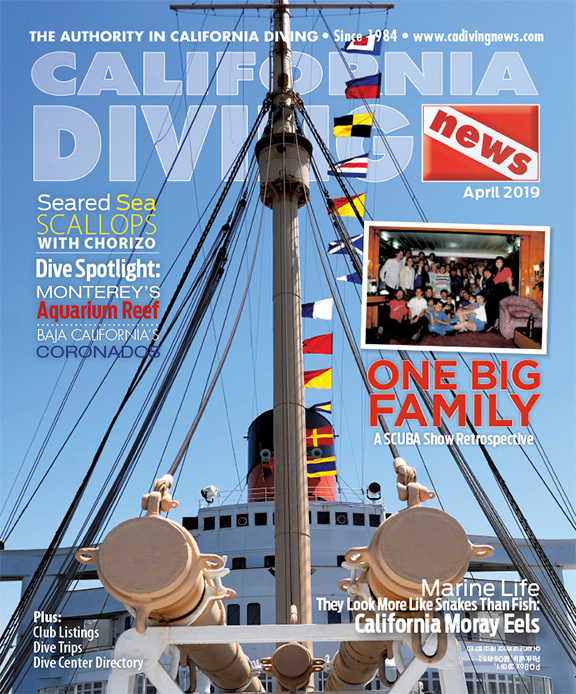 Divers might also find a few outrageous aeolid nudibranchs here. Two of the most common are red and white Hilton’s aeolid and orange and blue and white horned nudibranch. These are often found either laying eggs or feeding on hydroids. There are fewer fish here than at other Carmel sites, but there are still plenty to look at and photograph. Look for small gobies and sand dabs in the sand channels, and kelpfish and sculpins up on the rocks. There is normally a modest school of blue rockfish along the outer edge of the kelp bed, and gopher, brown, copper and the occasional vermilion rockfish on the reef. So check out the Copper Roof House. I suspect you will be impressed with the house and location, but I also suspect you will be more impressed with what you will find underwater.